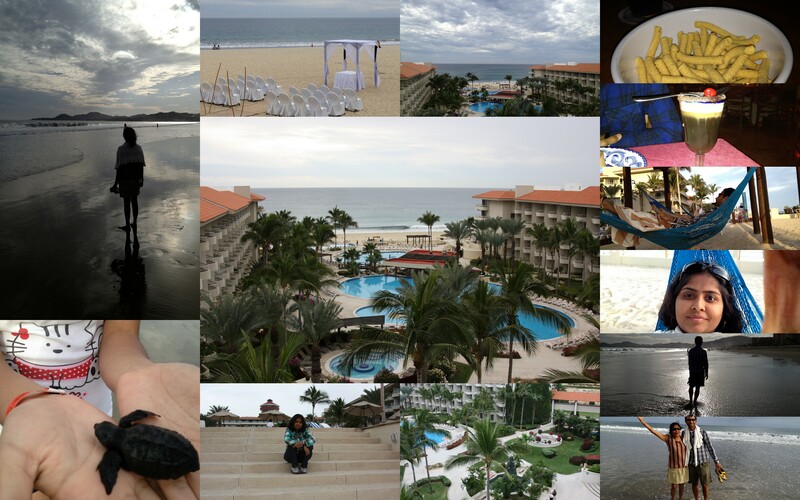 …A blog for archiving reflections and thoughts..
Year 2012 ended with a nice relaxing vacation at Cabo, Mexico. What a trip! The vacation started with a massage, walk around the town, parasailing, lands end tour, visit to TadosSantos,pingpong,pool,book reading,entertainment…. And FOOD, FOOD,…FOOD. 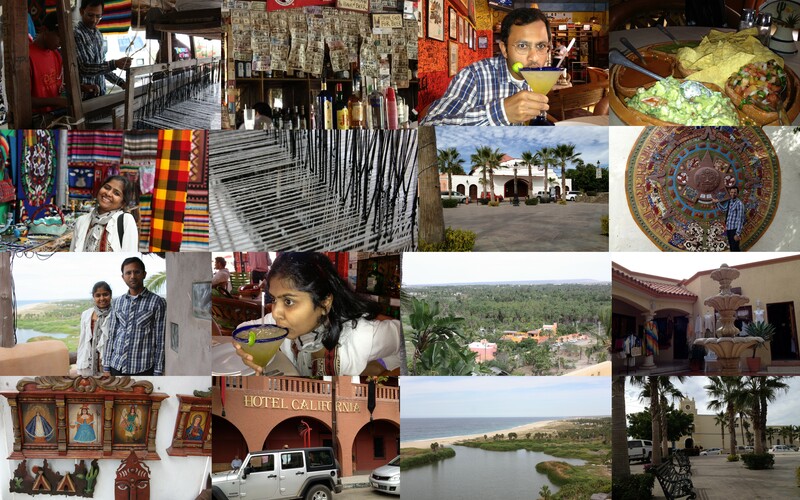 San Jose Del Cabo: A little coastal town, reminds you very much of India, with mud roads and pits right in the middle of the road. I loved it. This was as close to home as one could get. We encountered all these, as we walked away from the downtown, searching for a bank. The first building which we assumed to be a bank, was suggested duly by me , as it had a small sign saying bancomer, with visa,master card symbols..We walked in , encountered people speaking only in Spanish and partner tried explaining that he wanted some pesos.. I piped in, ” Bancomer???? Pesos” . Till today, I don’t know what the building was , but the lady at the counter did show us the route to the bank…yes, you guessed it, few blocks down the same road on which we were on. 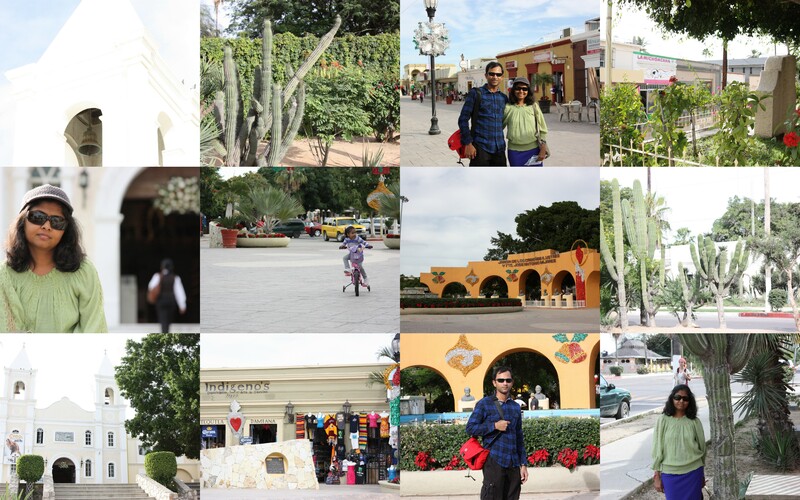 Tados Santos: A quaint,beautiful city nestled in the Baja California Sur. They “claim” to have the “HOTEL CALIFORNIA”, made famous by the Eagles.Wikipedia sees it differently though. This city is an oasis in the desert, filled with palm trees. A sight to behold. Surprise ! Surprise!, we found our californian roots in a homemade chocolate shop and to my delight,a juice( the real deal using an omega juicer) shop with free wifi, run by an american lady(who else?). Finished the tour with an authentic Mexican food. Yummy! Our charming, overly exuberant, talkative driver took us to his secret place, from where we could get the full view of the city, and where you get to whale watch as well.Lot of humpback whales frolicking close to the shore. Awesome! Oh! Btw, how can I forget the museum that we visited.North Americans(New world) don’t have much history and so, all they could muster was a washing stone( Vogiyo kallu(in Kannada)) and a grinding stone( ammi kallu(in Tamil)) No, I am not joking. Nostalgia! Reminded me of hostel days when it was a big chore and we all queued up with our bucket full of clothes and month old bedsheets to wash.
Parasailing- Cabo San Lucas: Given an option between snorkeling and parasailing,I decided to parasail.Was not too sure about snorkeling, as the water was a bit deep for my comfort level. No! You are not allowed to ask if I know swimming or if it would have made it easier if the water was any shallower.Lets leave it at that. It was the highlight of my trip. The captain and the sailor, both were very skilled and made it all seem very easy. And, we ended up whale watching during this trip. Too many humpback whales, close to the marina. We saw three in a row, playing around. 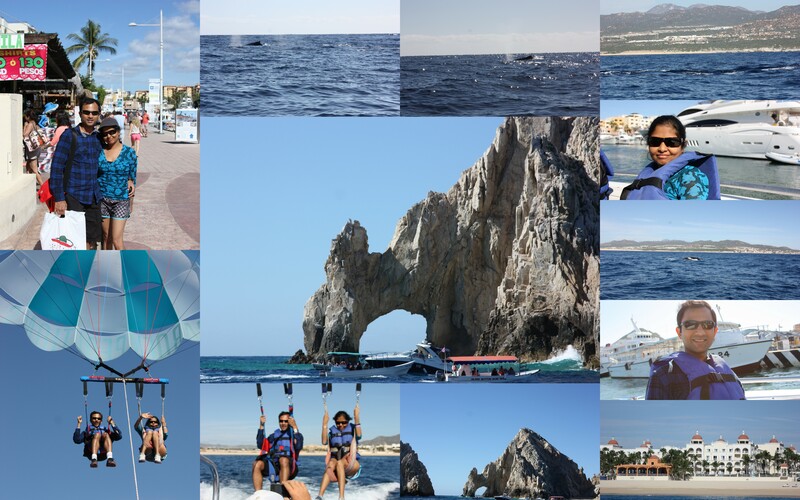 And, how can one mention Cabo San Lucas without clicking a photo of Land’s end.You can see some whales in the following collage. All-inclusive resort: A first for us. Food, drinks whenever you want,whereveryou want. 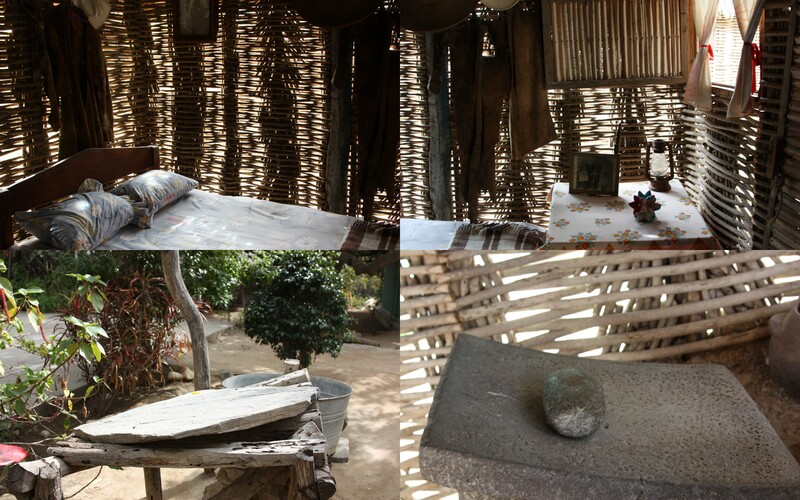 Lot of quite places to meditate, read and loiter in general. Noisy pools with kids running around. Enough entertainment to keep you occupied. We loved the Movie Trivia night, Karoake night and International dances night. Mexican was also part of the international dance night. What were they thinking?Waited for Bhangra, but never happened. Oh Well! Wow…nice pictures Suroba….both of you looking good! The parasailing video is awesome! Keena wants to know when she can go!! Hi there, Myself Sukhmeet Singh from Punjab . I am a blog writer and owner of a blog named Happy to Meet (http://happytomeet.blogspot.in).